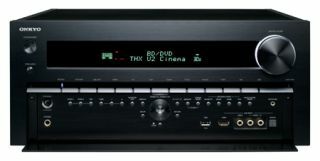 Onkyo unveils flagship 2011 AV receivers and network controller | What Hi-Fi? Onkyo's been on something of a roll of late, with an ever-exanding range of budget and mid-price home cinema receivers, adding additional features such as Spotify and AUPEO! internet radio along the way. Completing its 2011 line-up are the flagship TX-NR5009 (top, £2700) and TX-NR3009 9.2 (£2000) multichannel receivers, and the PR-SC5509 network AV controller (£2200). All three are THX Ultra 2 and ISF (Image Science Foundation) certified, and are fully network enabled. Audio is handled by 192kHz/32-bit TI Burr-Brown DACs on all channels, coupled to a 32-bit DSP chip. Video is handled by an HQV Vida VHD 1900 processor, while Marveo's Qdeo technology upscales 1080p video to a full 4K (3840 x 2160) resolution..
With 9.2 channels, the TX-NR5009 can be configured to power additional stereo sources in two other rooms. And the unit will handle FLAC, WMA Lossless, WAV, AAC, Ogg, MP3 and SACD audio. MulltiEQ XT32 room correction and equalisation technology will adjust the sound to suit the acoustics of your listening room, while DTS-Neo:X audio processing technology allows users to add speakers in three diffrerent configurations to a basic 5.1 channel system. The TX-NR5009 has eight HDMI inputs, two HDMI outputs, two USB ports and a universal port for Onkyo peripherals. Users can download free Onkyo apps to turn their Android or iPhone/iPod Touch into a full-function remote control. Onkyo says the TX-NR3009 model (above) offers many of the same features as its more powerful sibling, but uses 24-bit TI Burr-Brown DACs rather than the 32-bit ones. It also forgoes the pricier model's gold-plated terminals and also uses a different transformer and capacitors. Finally, the Onkyo PR-SC5509 network AV controller (below) is designed to partner a high-end multichannel power amp and incorporates all the processing and connectivity features of the TX-NR5009, minus the amplification. All three models will be available in the UK from September, in silver and black.